AGT International supplies the widest range of ISO 17025 gas and liquid phase mixtures from locations in Florida and Houston to international markets. ISO17025 compliant mixtures in accordance with EPA-600/R-12/531 (May 2012). Liquid mixtures in low pressure and piston cylinders. Advanced analytical capability enabling us to offer fully analysed blends. Industry leading cylinder preparation techniques enabling us to offer multi-year shelf lives even on ppb mixtures with reactive components such as oxides of nitrogen and Sulphur compounds). A huge inventory of component chemicals enabling us offer highly complex mixtures with unusual components on short delivery times. Whatever your need, AGT International is able to provide the optimum solution. *3 – Maximum Shelf life is limited to the shelf-life of the SRM used for traceability and may range from 1 to 8 years depending on the components. Mixture Preparation Tolerance is the variation of a component from the requested concentration. Individual applications have differing requirements on the preparation tolerance and AGT International supplies a range of mixture classes designed to meet the needs of our customers. As well as our standard Certified and Primary Standards we also have custom standards where only the requested concentration is reported on the label. In addition we are able to offer tighter preparation tolerances on request. Analytical Certification Tolerance is the term used to indicate the level of certainty of an analysis. Any analytical measurement has a small amount of acceptable variance in the result which is reflected in the table below. Again, as with preparation tolerances, we are able to offer tighter analytical tolerances on request. Blending Methods: Mixtures are blended using gravimetric techniques where components are added based on mass calculations in accordance with ISO 6142 using highly accurate electronic scales. All weights used to calibrate our scales are ASTM Class 1 weights with Echelon 1 NIST Traceability and are annually certified traceable to NIST by 3rd party, NVLAP accredited, metrology labs. In addition to gravimetric techniques we may employ a combination of partial pressure, serial dilution, and syringe inject techniques, depending on the desired mix components and concentrations. Analysis: All mixtures are confirmed by instrument analysis to conform to the specifications of our customers and to our company SOPs. For all NIST Traceable mixes we adhere strictly to our scope as described in our ISO 17025:2005 accreditation for calibration and testing. Individual analyzers employ methods of detection including chemiluminescence, total hydrocarbon flame ionization, non-dispersive infrared, electrochemical, electrolytic and paramagnetic detectors. Gas chromatography is heavily relied upon using a variety of detectors including thermal conductivity, flame ionization, pulsed discharge ionization as well as the latest in micro-GC technology. All of our analyses are comparative in nature. In other words, candidate mixture concentrations are named by comparing the detector response generated by the candidate mixture to the response generated by a reference gas mixture on the same instrument in a detection range that is well characterized. The accuracy of the analysis is directly related to the accuracy of the reference standard used. The reference standards used are NIST Standard Reference Materials (SRM), NIST Traceable Reference Materials (NTRM), Gas Manufacturer’s Intermediate Standards (GMIS), or Internal Primary Laboratory Standards. Click here for examples of Certified, Primary, NIST Traceable and EPA protocol certificates of analysis. 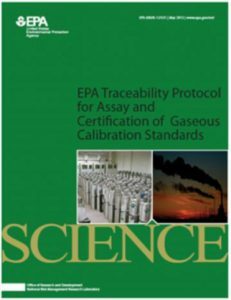 The most prominent of our core competencies is in the manufacture of NIST Traceable calibration gas standards in accordance with the latest EPA Traceability Protocol for Assay and Certification of Gaseous Calibration Standards. Our state-of-the-art analytical laboratory is ISO 17025:2005 accredited for calibration and testing (Certificate #69191) and our scope of proficiency is specifically related to the EPA Protocol. We participate annually as required in the Protocol Gas Verification Program audits for both ambient and source level concentrations (PGVP ID #N12011). These mixtures are used specifically for the calibration and audit of Continuous Emission Monitors (CEMs). Our EPA Protocols are NIST traceable and produced in accordance with the latest EPA specifications found in document EPA 600/R-12/531 (May 2012). These specifications require an unbroken chain of measurements directly against a NIST SRM or its equivalent, AND also a series of quarantine periods between additional analyses that insures the long term stability of the gas mixture. In addition, the repetitive analyses affords sufficient statistical data to insure that the total expanded uncertainty of the results reported on the certificate of analysis will not exceed 1% relative to minor component at the 95% confidence level with a coverage factor of 2 (k=2). Blending techniques are not specified in the Protocol and a method of blending is chosen based on the components of interest and the desired target concentration. Target concentrations are based on the regulated customer’s monitoring requirements and the availability of NIST SRM materials at the desired concentration. A mixture may not be certified as an EPA Protocol mixture unless the manufacturing location has an appropriate SRM or its recognized equivalent available. In addition, the manufacturing location must have a current PGVP identification number indicating that the manufacturing location participates in the required audits conducted via the Protocol Gas Verification Program. It is very important to note that all custom mixtures cannot be certified as EPA Protocol mixtures. A protocol mix must have the same components as are available as NIST SRM materials or their recognized equivalents. This includes the balance gas in the mix. In addition, the maximum concentration of the minor component permitted to be certified as an EPA Protocol mix must be equal to or less than the concentration of the available SRM material. NTRMs are certified by the National Institute of Standards and Technology (NIST) and are accepted by the Environmental Protection Agency (EPA) as the most accurate standards available commercially. NTRMs are recognized SRM equivalents in the most current EPA Protocol document. The NTRM program was established in 1992 in partnership with the U.S. Environmental Protection Agency and specialty gas companies as a means for providing end-users with the wide variety of certified gas standards needed to implement the “Emissions Trading” provision of the 1990 Clean Air Act. Gas NTRMs are produced and distributed by specialty gas companies with NIST oversight of the production, as well as direct involvement of the analysis. NTRMs can be developed for any pollutant, concentration and balance gas combination for which a NIST primary standard exists. The gas standards prepared according to this program are related, within known limits of uncertainty, to specific primary standards maintained by NIST.